method | Another dot in the blogosphere? We live in testing times, not least because of people like Trump and the consequences of their thoughtlessness. Last week, the local press bragged about how Singapore universities were moving towards electronic examinations. The reasons for changing the medium of exams were relatively superficial. Legibility of writing and saving paper are natural shifts in switching media. That is like saying switching from a bicycle to a plane lets you travel further and faster, and allows you to have a bird’s eye view. Of course you would! There was no mention of how switching to electronic forms was not only more aligned with how we consume media today and how many students take their notes. The latter, in turn, is linked to the practice medium matching the task medium. If you do not understand the last point, consider a common response from teachers: Why should we use computers when students still have to take exams with papers and pens? “Efficient” or “efficiency” was mentioned at least four times in the short article. Apparently, more effective ways of measuring learning were not on the radar. The paper claimed that universities were “adopting more creative ways of assessment… audio or video segments, and interactive charts and graphics”. Again, that those are functions of richer media. But can students also respond in equally creative and critical ways? Apparently not since “the students will have a ‘lock-down browser mode’ to prevent cheating, which cuts access to the Internet”. Those that prepare the e-exams would rather set the same type of lower level Google-able, app-solvable questions than to change their methods and set unGoogle-able questions or tasks instead. I said it in my tweet and I will say it again: This is a change in exam media, but not a shift in method or mindset. Still on the topic of tests, I tweeted a WaPo article last night. TLDR? Here is a comic I found in 2014 that summarises the take home message. The WaPo article did an excellent review of a national exam in the USA and tested the test with the help of three researchers. The researchers were experts in the content area of the test (history) and of assessment in general. Those tests were also going electronic or online. But again the change in medium was apparent; the change in method was not. If we are going to design better forms of assessment and evaluation, we need to think outside the traditional test. This Twitter jokester gives us a clue on how to do this. The test looks like a simple two-choice series of questions. However, the test-taker has the liberty of illustrating their answers. This provides insights into their mindsets, belief systems, and attitudes. This makes such tests harder to quantify, but this is what changing the method entails. It is not just about increasing the efficiency of tests, it is also about being more effective in determining if, what, and how learning takes place. Godin’s point was how current tools, methods, or systems can often limit future tools, methods, or systems. A digital parking system should not just replace the old version by replicating its functions but actually improve them or change them. If an old parking system required you to guess how much time you were going to park or allowed you to cheat, then the new one should remove the guesswork by determining exactly how long you parked. You should not not marry old strategies with new technologies. But we do that all the time, and education is no exception. We might have experienced how lectures happen with a chalkboard, overhead projector and transparencies, PowerPoint, SlidesShare and virtual world. The tool and medium change but the method does not. 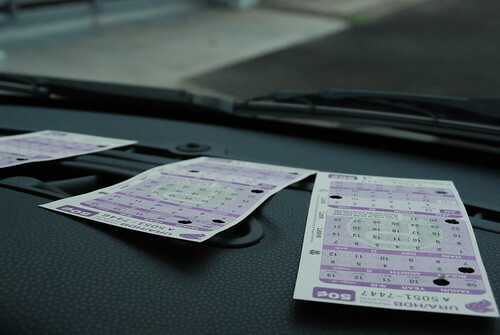 Keeping our antiquated parking coupon system in the presence of an electronic one might waste resources, but it just creates an inconvenience now. If we change the medium of instruction but not the method, we do this to the detriment of our learners now and in future.